A quick disclaimer before I start this post: while these were the best-ever brownies when my friend made them, my attempt was somewhat less successful: even a minute or two of over-cooking will eliminate the incredible gooey-fudginess this recipe is capable of producing, so MAKE SURE YOU DON'T OVERCOOK THEM! However, as long as you check on them regularly (and err on the side of taking them out of the oven too early rather than too late), then they should turn out every bit as delicious as hers were! Melt the butter and chocolate pieces in a heatproof bowl balanced over a saucepan of simmering water. Add the salt and stir until smooth, glossy, and fully combined. (Have a little taste if you must!). Remove from the heat and allow to cool for a minute or so. Meanwhile, in a seperate bowl,beat your eggs together with the sugar (both types). When the chocolate has cooled slightly, stir the egg and sugar mixture into the melted chocolate, bit by bit. Finally, fold in your flour. To avoid over-cooking, it's probably best to check your brownies around the 20 minute mark - and if you don't mind them being a bit under-cooked, you could even remove them early for an extra-fudgy texture. 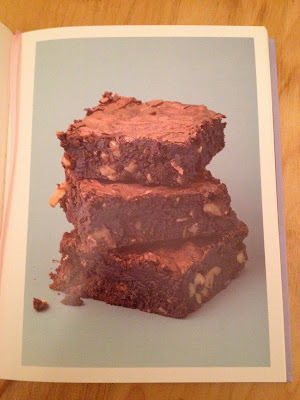 Leave the brownies to cool completely in the tin, then cut into squares and serve! They should keep (ha!) for a couple of days in an airtight container.